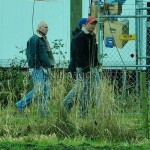 With the Superman movie still one of the most secretive movies in development at the moment we have the first picture of Kevin Costner As Jonathan Kent as he walks the set of the Kent Farm. He was cast to play Clarks father right from the beginning but with so many changed and new cats members it’s great to finally see him walk as Superman true mentor as he grows up in the small farm town of Smallville. One thing to note is how much of the film has actually been filmed in Smallville. We are a good six months into the movies filming and 90% of the pictures have been in Clarks home town. This could be that either the set is the most un protected or that Smallville will play a big part in the movie.